Today I have been reading quite a few articles about learning, especially in the areas of PBL and STEM. I then saw a tweet about this Infographic from Mia macMeeken. The ideas here reflect a few key ideas from the articles I have been reading. Learning can happen anywhere and not be seen as something that can only be done in a classroom. Learning needs to be authentic and involve real-life experiences. Creativity is an essential part of learning. Your Online Presence is a Digital Tattoo, Not a Footprint | The Golden Age of Education Some nice infographics that explain why why we must model and demonstrate how to actively create digital tattoos instead of passively leaving digital footprints. IFLA School Library Guidelines, 2nd edition This is the new edition of the School Library Guidelines, approved by the IFLA Professional Committee in June 2015. These guidelines constitute the second edition of the IFLA ‘School Library Guidelines’. The first edition of the school library guidelines was developed in 2002. They have been developed to assist school library professionals and educational decision-makers in their efforts to ensure that all students and teachers have access to effective school library programs and services, delivered by qualified school library personnel. Microsoft Touch Develop – create apps everywhere, on all your devices! 8 Apps for Testing Student-Created Curriculum Many teachers still create their own lesson plans, activities, and assessments based on curriculum standards and scope and sequences provided by their various educational guiding bodies. Technology can give students more opportunities whilst still allowing teachers to maintain a guiding hand. Stories Teachers Share | Free listening on SoundCloud Katrina Schwartz and Ki Sung at MindShift started a podcast titled “Stories Teachers Share”. It highlightst the many varied and interesting work teachers do daily. It gives teachers the opportunity to help the larger community better understand what it really means to be a teacher. Portal 2 Puzzle Maker – Valve Developer Community “The Puzzle Maker (also known as Puzzle Creator or Editor) is an in-game puzzle editor that allows the creation, testing, and publishing (to Steam Workshop) of custom single-player and co-op test chambers. The Editor also adds new lines from Cave Johnson which, altogether, adds a story to downloaded test chambers. The DLC introduces the player to “The Multiverse” which contains an infinite number of Earths, an infinite number of Apertures, and therefore, an infinite number of test chambers. 10+ Tips for Using Brain Based Methods to Redesign Your Classroom | EdSurge News Interesting article. If are you looking to redesign your learning environment, this piece offers some ideas about where you might start. 10 Things Every Teacher Should be able to do on Google Docs | Indiana Jen Google Docs is a powerful word processing tool that many schools are now using. Most of its features are intuitive to use and it can function like of a traditional word processor, it also provides more capabilities that offer teachers many valuable options. What Your Students Really Need to Know About Digital Citizenship | Edutopia “Digital Citizenship or Just Citizens? There are those like expert Anne Collier who think we should drop the word “digital” because we’re really just teaching citizenship. These are the skills and knowledge that students need to navigate the world today. We must teach these skills and guide students to experience situations where they apply knowledge. Citizenship is what we do to fulfill our role as a citizen. That role starts as soon as we click on the internet. In the classroom, there are two essential approaches in the digital citizenship curriculum that Vicki Davis uses to teach: proactive knowledge and experiential knowledge. Digital Shop Class: Game Based Learning, Design Thinking & More! 10 Epic Tools Busy Teachers Need to Be Aware of A useful annotated list of tools. Studio Pango | Funny apps for smart kids Young reader are in control with this reading app. It allows them to be directly involved in the story. They are encouraged to explore what’s going on, find hidden objects, move characters from one place to another, and more. The reading levels progress as the student improves so the app allows kids to move onto more complex texts when they are ready. PlayTales Kids apps | iPhone, iPad, Android Interactive books for kids | Apps for children. This app, available on IOS and Android, gives students unlimited access to classic, new, and educational stories (for a low monthly fee). Because it’s interactive, students are encouraged to dive deeper into the text, whether they’re simultaneously drawing or watching the words come to life with animation. What Should I Read Next? Book recommendations from readers like you This simple website does one thing: tells you what books to read based on the book you input in the search field. Students can get frustrated when selecting their own reading material, making reading more stressful than it needs to be. Give your students access to this website when choosing a new book; they’ll be excited to see what comes up and feel more confident with their choices. A Beginner’s Guide To Personalized Learning – “There is a difference between personalized learning and differentiation. Differentiation is a kind of personalized instruction, where teachers adjust process, & product, according to a student’s readiness, interest, & learning style. 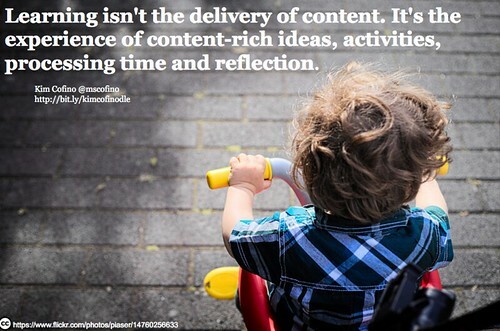 Planning of the learning starts with the content, and the content remains the same for all students. This is a school and curriculum-centered approach that attempts to amend the delivery of the content to match the student’s needs, strengths, and general readiness. Digital Citizenship Resources for the Home | Common Sense Media “You don’t have to be an expert on texting, Instagram, Minecraft — or whatever else your kids are into — to have The Talk. Start by reading up on what’s going on in your kids’ world (for younger kids and older kids). Ask them to show you what they like online, and why. Make sure to listen 🙂 Then, express a few basic expectations, with the understanding that this isn’t a one-and-done kind of chat. A Collection of Project Based Learning End Products — Learning in Hand “Post discusses products created by students through project based learning experiences, with an emphasis on what students create to express their answer to a driving question than just read a summary of the project. A vision of educational technology | Teaching using Web Tools for Educators The author concentrates on what she thinks is the most important point that should be made concerning the use of technology in class.”If your technology use in your classroom is for Powerpoint presentations and taking notes, you haven’t really understood the potential. If you as a teacher think you need to know it all before letting your students loose, you need to reconsider. A second great infographic by Mia MacMeekin It offers an addititional infographic that compliments the first, with similar ideas but also a few different ideas. I have been working teachers and their year 7 students. They have been working in literature circle groups and others on some research activities. It is interesting watching the dynamics and how different groups and classes perform their tasks. 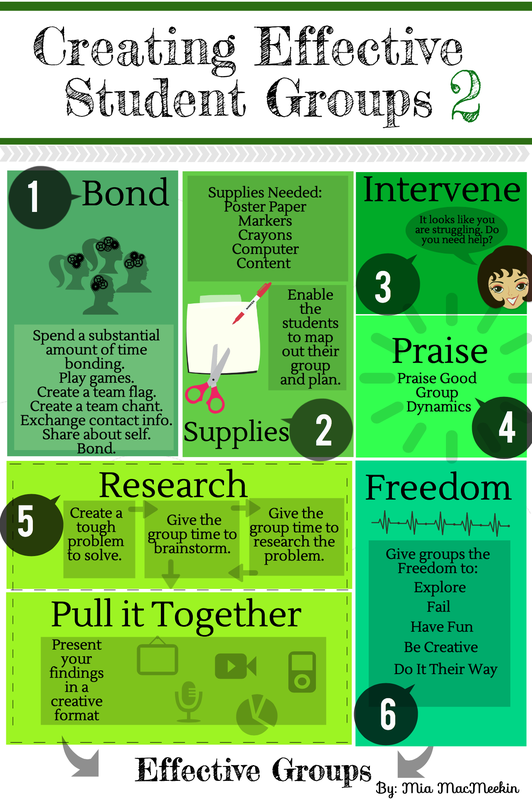 It is easy to put students into groups but creating effective student groups takes a bit more work. Create a ZPD Zone. This refers to Vygotsky’s Zone of Proximal development. He frames student ability in terms of developmental range. This is different for each student and understanding the different ranges for the students can assist in making decisions about the groups. Give Them Something to Do. 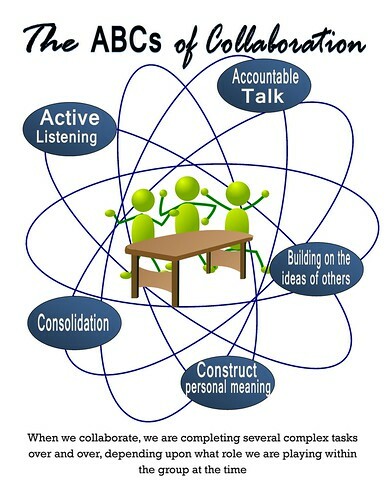 Use the PBL (Problem-based learning) approach which works well in a group setting allowing for different knowledge and strengths of all in the group. Facilitate the team bonding by assisting in the initial brainstorming activity. The trust that comes with good team bonding allows everyone a voice and participation by all. Flipping the classroom: where do your sit? I watched another report this week about how getting good marks is the main goal of education and students are doing anything to achieve the highest marks possible. This aim was not about being a better learner but about the game of beating the system. When marks, not learning or understanding how to learn, become the ultimate concern,the education system is in trouble. I enjoy reading about what some schools and teachers are doing to get their students engaged their learning. I love seeing students taking responsibility for their own learning and even more, enjoying the process of learning. These students are giving themselves a good basis for being successful throughout their lives. I have been reading more about flipped classrooms lately. These classes offer a type of learning that seems to fit the bill about allowing students to take responsibility for their learning. One article entitled About flipped classrooms from the University of Queensland gives a good description of the roles and expectations of teachers and students in flipped classrooms and the important technologies. They also provided the diagram below about “the Learning opportunities of the flipped classroom (adapted from Gerstein)”. There are also useful links to more information. I also found the infographic below, from a post “Is a Flipped Classroom Right for You?” by Jennifer Prescott on the We are Teachers site, useful. It would help any teacher work out where they are in relation to “flipped classrooms”. It clearly sets out some of the basic ideas then leaves any reader with enough knowledge to investigate further. Another great resource about this topic is a post on the coolcatteacher blog, “Preparing your students for flipped learning”, where Jon Bergmann talks with Vicki Davis about this with many examples given. He explains the difference between flipped classrooms and flipped learning, which is more in-depth pedagogical method. Jon explains how to flip learning in areas without connectivity, how this system improves learning, and raises grades.